What Does Flank Steak Taste Like? Flank steak is technically not a steak at all. Instead, this popular cut of beef comes from the cow's belly muscles. It’s a flavorful piece of meat, but is very lean, containing almost no fat. Despite its toughness, it can be a tasty, tender steak if you learn how to prepare it properly. Flank steak benefits from marinating, and is best enjoyed grilled over high heat or slow-braised. Flank steak comes from the cow’s lower chest or abdominal muscle, and is an inexpensive, flavorful, and versatile cut of beef. It’s about a foot long and one inch thick, and cooked whole rather than divided into smaller individual steaks. The cut is also known as jiffy steak, bavette (in French), and in some regions, London broil. 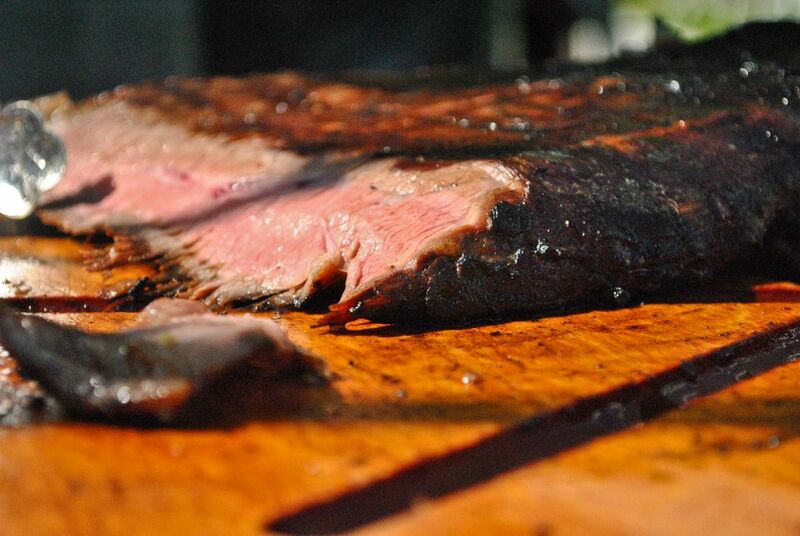 Flank steak can be identified by the visible direction of the meat’s cross-grain. Due to flank steak’s low fat content, it does not need to be trimmed. It can be seasoned simply with salt and pepper or your favorite meat rub, and typically requires additional tenderizing in order to achieve the best flavor. This can be done by hand with a meat tenderizing mallet, chemically using an acidic marinade, or by cooking the steak “low and slow” to gradually break down its dense connective tissue. Flank steak is ideal for fajitas, stir-fries, and other applications that call for beef strips. Rest cooked steak for at least five minutes before serving, and slice thinly against the grain, preferably at a 45-degree angle, for the best texture. Slicing with the grain will result in an unpleasantly chewy steak. Photo: gmnicholas // Getty Images. Photo: BDMcIntosh // Getty Images. Photo: 4kodiak // Getty Images. Photo: Juanmonino // Getty Images. While flank steak lacks the silky, fatty mouthfeel of more-marbled cuts of beef, it does offer a rich, assertive, beefy flavor that takes center stage in any application. Since this cut benefits greatly from marinating, especially when grilled, you may taste notes of citrus, fruit juice (especially orange and pineapple), soy sauce, mustard, Worcestershire sauce, wine, or other acidic or enzyme-rich ingredients used to tenderize a flank steak before cooking. Skirt steak is often substituted for flank steak, cut from the nearby diaphragm region, and featuring a similar prominent grain. It has more fat than flank steak, resulting in richer-flavored meat that’s also ideal for grilling, tacos, fajitas, and stir-fries. Like flank steak, it must be sliced against the grain in order to be tender. Flank steak is an excellent choice for tacos, fajitas, stir-fries, rice and grain bowls, or simply marinated and grilled alongside seasonal vegetables for a simple, nutritious meal. You can buy flank steak in grocery stores with a well-stocked refrigerated meat section, and at butcher counters across the country. Since this cut is not always available at all butchers, you may want to call ahead to check. Flank steak is sold by the pound, and servings vary: One flank steak can weigh between one and four pounds. Choose a steak that’s uniform in thickness to avoid overcooked ends. Flank steak can be bought in bulk, vacuum-packaged, and frozen for six to 12 months. Store uncooked flank steak in the refrigerator at or around 35° F wrapped in butcher paper or supermarket packaging (called “modified atmosphere packaging” for its carbon dioxide content, which helps preserve the meat) for up to three days. Cooked flank steak will keep in the fridge for up to four days. Flank steak can be frozen in its original packaging for up to 12 months; however, vacuum-sealing it first will significantly prolong its life and help prevent freezer burn.